The diversity of manufacturing and craftsmanship in Germany is an integral characteristic of Defakto. Very few watch brands can offer such high in-house added value. From the concept, to the design, the development of prototypes, the production of watch cases, surface treatment, engraving, customization, assembly, final quality control and shipping: every part of making a Defakto watch is performed either in Pforzheim (production, watchmaking, quality control) or in Karlsruhe (design, development, communication, final assembly, dispatch). Likewise, Designer and Managing Director Raphael Ickler is responsible for all product photos, web design and brand and customer communication. 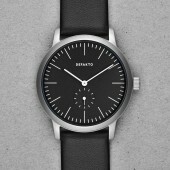 Aiming to find the perfect symbiosis between form and function, Defakto produces high-quality, German-made watches for purists. 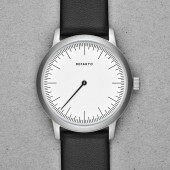 The design of all Defakto watches recalls the teachings of the Bauhaus school while maintaining a strong contemporary aesthetic, for a timeless, characteristic design. The one-man structure of Defakto allows a watchmaking process that is regional and sustainable, producing authentic watches of high manufacturing quality and with clear, stringent design. Simple geometries, precise proportions and acclaimed build quality ensure that every Defakto watch will have a timeless appeal that you will enjoy as much today as in the future. 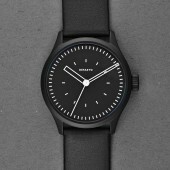 Defakto watches are available online through this website or on-site at our premises in Pforzheim or Karlsruhe. 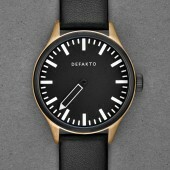 A few small boutiques, jewelers, watch shops and online retailers also offer Defakto watches in other countries. If you are interested in cooperation or general information on this topic, please contact us. 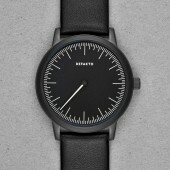 Your Defakto watch comes with a two-year guarantee from date of purchase. Naturally, after the guarantee period has expired, Defakto will remain a reliable contact for everything regarding your watch. Defakto offers ongoing service and maintenance at fair prices. 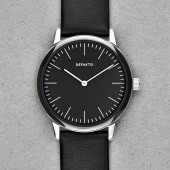 You can return your Defakto watch in its unworn, original condition without damage within 14 days. The immediate costs of the return has to be paid by the ordering party. After receipt and verification of the watch, the purchase price will be returned to you immediately. Defakto recommends you have your watch inspected every 4-5 years. This service can be performed at the Defakto Watchmaking Factory in Pforzheim, at one of our service partners abroad, or at a trusted watchmaker in your area. 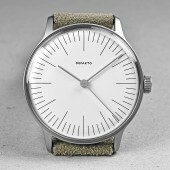 As most Defakto watches are custom-made on request, the delivery time of your watch is usually 2-4 weeks after receipt of your order and payment. A custom design usually takes 4-6 weeks. If the watch is already in stock, the delivery will be sent immediately after receipt of your payment. Defakto is a member of the "Deutscher Werkbund" – an institution founded in 1907 by Peter Behrens – the "Wiener Werkstätten", as well as other collectives of craftsmen and professionals. The Deutscher Werkbund is an "association of artists, architects, entrepreneurs and experts" with a long history of innovation that gave rise to the Bauhaus movement. It remains a key initiator in the fields of modern architecture and industrial design to this day. Defakto is one of the 150 selected German workshops and factories that participate in the international exhibition "Handmade in Germany". The Werkschau, curated by the Direktorenhaus Berlin, was launched in cooperation with the German Chamber of Industry and Commerce (IHK) and the German Ministry of Foreign Affairs. By 2019, high-quality products with unique features will be presented in the modern arts museums of the metropoles of Canada, China, Europe, Japan, Russia, the USA and the United Arab Emirates. Every Defakto watch can be customized with respect to surface, engravings, modular parts such as case-back style, watchstraps, domed sapphire crystal or packaging upgrades. For special fonts or patterns for laser engraving, a vector graphic is required as a 'dxf', 'eps' or 'ai' file for the program creation. A right of return on customized products can not be granted. 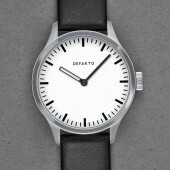 You can pay via Paypal or classical wire transfer via the Defakto Watches online shop. If you would like to purchase your watch upon visiting the Defakto premises in Karlsruhe or Pforzheim, payment can only be made by cash. For all orders from non-EU countries, VAT is automatically deducted from the order. For reasons of transparency, Defakto always shows prices including and excluding VAT on the same page. The VAT deduction occurs directly after entering your address in the checkout of the shopping cart. All watches shipped are insured. Shipping costs to your country are indicated during the ordering process. 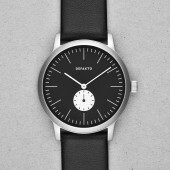 Worldwide, the watches are shipped with Fedex International Priority Services at a price of only € 20.00 – € 40.00 and handed over personally at your door via signature. For customers from Germany, shipping via DHL is free of charge. When shipping your watch to a non-EU country, individual customs or tax charges can not be included in shipping charges. If you want to declare these costs in advance please contact your local customs authority office to get up-to-date information about the exact import fees. 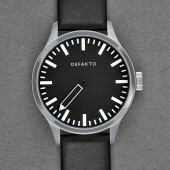 Defakto watches are shipped exclusively by DHL (Germany) or Fedex (worldwide). After handing over your watch to the shipping service providers, your tracking code number will be sent to you. You will also receive a message regarding the expected delivery date. Hi Raphael, My new Akkord Modular arrived quickly and safely on Monday morning and I am very pleased with it. The case finishing is exceptional and the design and function of the watch are also excellent. The accuracy of the movement thus far has been very good and is well regulated. 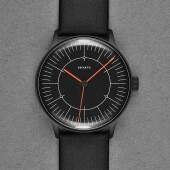 I have received many compliments on the watch so far from others. Thanks again for designing and building such a great timepiece! Have a nice week. 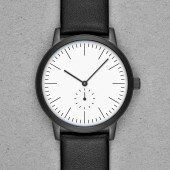 Best Regards, J. S.
I have received my watch and I am delighted with it. Thank you for providing not only a superb product, but also a most straightforward, sensible and efficient purchasing experience. Bravo! With kind regards, C. F.
Good evening Raphael Thank you - the watch was delivered today and we are extremely pleased with it. The watch is going to London as it is a present for my son. 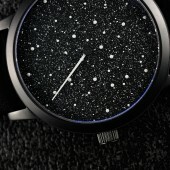 I am sure my son will be very happy with the watch as he works as a designer for P.... He has always had a love of watches and loved the design of your watch that he found on the Internet. Thank you for keeping us informed about the delivery and we wish you every success for the future. 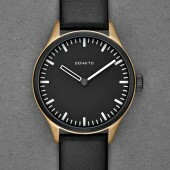 Kind Regards L. H.
Hi Raphael, Thanks for expediting the delivery of the wrist watch. It's a gorgeous piece that I look forward to wearing for all occasions. I've already had several compliments and my girlfriend loves it. Keep up the excellent work and service! Best regards, M.
Dear Raphael, the watch arrived safely on friday. I am very pleased with the design & finsih. Many thanks for you help with purchase. Regards B.
Hello Raphael, Thank you for your email and correspondence over the past few weeks. I am happy to report that the watch was delivered! And my boyfriend was delighted with the watch, it made our graduation extra special. It's a beautiful watch which I am sure he will be showing off to everyone! Once again thank you for your time and efforts, it is hugely appreciated. I will be recommending your company to everyone! 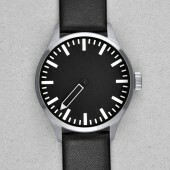 Best wishes, L. W.
Hi Raphael The watch arrived yesterday and in a word 'beautiful'. I will update you as to what kind of response it gets from my Japanese friends in the near future. I can't imagine why they are not popular here other than lack of marketing exposure - usually anything minimal, carefully designed and German/European is very sought-after here. Best regards. N.
Dear Mr. Ickler, I got the watch. It looks even better than the pictures. Love it! D.
Thanks for your email! I picked it up at the Fedex office yesterday, and am wearing it now. 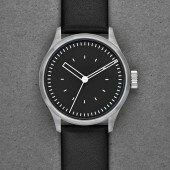 It's a wonderful watch--beautiful and remarkably practical. Best, T. J. Thanks Raphael! As said I've been very happy with your watch. Thanks for making something a bit different. Nerds like me really appreciate stuff like this. :) S.
Hi Raphael, thank you. I just got it toady. Absolutly stunning work! 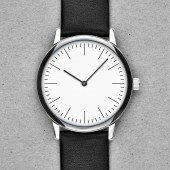 Have a great weekend -F.
Dear Mr. Ickler, I have received the watch today and it’s very beautiful. I really like the design wouldn’t want it to be anything else. It does look tiny a bit larger than expected, as some people might have mentioned that they prefer 40/38mm case diameter. The lugs don’t overhang on my wrist so I think it’s great, and the last hole of the strap actually works for my small wrist. Thank you very much for such a nice watch and the great service you have provided. I would certainly recommend Defakto to the others when opportunity presents. Best, C. L.
Hello Raphael My watch has arrived as promised today. I am very happy with it and feel it is a good addition to my collection. 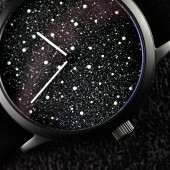 My partner also really likes it and has enquired as to whether you plan on releasing a female collection of watches? Regards S.
Dear Raphael, Sorry for the late reply, wanted to wear it for a while before I tell you how I feel with it! Thank you so much for sending me such a nice watch! The casing is really nice, its hard to find a word to exactly describe how I feel about it. Simple but very smart and grand looking indeed. Really great work Raphael! Will definitely buy again in the future. Will you have new design in the near future? Its not like I don't find the current designs appealing, I quite like the Bronze Akkord Modular to be honest. Well, big thanks again! 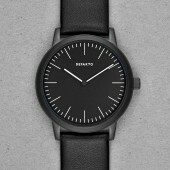 Kind regards, B.
Hi, I received my watch. 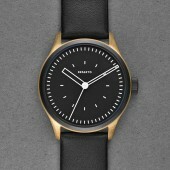 I just want to tell you that it's a beautifully designed and crafted watch. 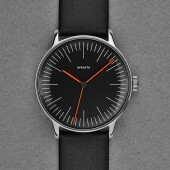 I'm a User Experience and Graphic Designer and the Akkord reminds me so much of Ulm, Dieter Rams and of course, the Bauhaus movement...Bravo! J.
I have received this beautiful instrument. I am grateful for the opportunity to wear it. Please thank the designers and crafts people who made it. I plan to purchase several more from your catalogue as gifts for colleagues. Again, many thanks. 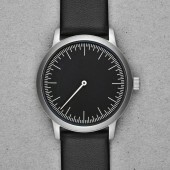 T. D.
Watch arrived - very elegant - time simplified - delighted with it!!! p.